Because of the recent hype around the 18th Anniversary reissue of Pearl Jam’s debut Ten, I’ve been diving back into the catalog of a band I haven’t listened to with any real interest in about 8 years. What I’m finding is that the first 4 PJ records are absolute monsters. Ten and Vs. reek of an earnest early ’90s obsessed with absent fathers, gun violence, homelessness, heroin, abortion, teenagers with “issues”–the sort of poker-faced stuff the culture wars of the early Clinton years fed itself with. Ten, which I thought for years was a.) overblown and b.) the genesis of the band I hate most in the world, turns out to have one-upped Loveless in the textured guitar department (this is how you do reverb and compression, folks); plus Eddie Vedder sings like Al Green or Van Morrison or somebody, a soul shouter always ready with a well-placed holler or mumble. And Vitalogy. My god. This is one of the best albums of the ’90s. No joke. For all the talk about experiments and brittle punk rockers, don’t forget that Vitalogy is Pearl Jam’s most tuneful record. These are great melodies, well-played by a limber band. (Listen to the guitar solo on “Immortality.”) The songs on Vitalogy have a classic quality that seems to have started to elude PJ around Yield, when, not coincidentally, Ed Ved started letting the other guys write melodies and started trying to write Fugazi songs (“Grievance”? “Insignificance”? Yuck.). That still doesn’t negate the fact that PJ’s albums are among the best-sounding albums of all time. Listen to these fuckers on headphones and they sound incredible. Like Led Zeppelin and The Who, their two most frequent comparisons, Pearl Jam’s secret strength is an absolute killer bass player. Jeff Ament’s melodic licks are the tastiest parts of any Pearl Jam song — enough to distract you from the often-terrible lyrics. God, what kind of dork am I, going on about Pearl Jam like this? Jesus. Well I’ve been away, folks, but I’m back. This “real life” thing sometimes gets in the way of blogging. I hope you all understand, and I hope you’ll stick with us. Anyway, this is another standout track featuring the harmonica. 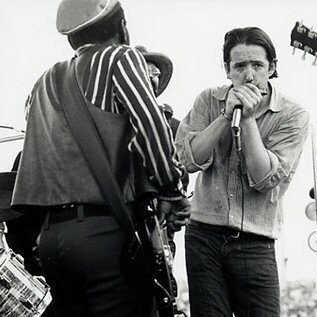 The Butterfield Blues Band is perhaps best known as Bob Dylan’s backing band (sans Butterfield himself) at the 1965 Newport Folk Festival, which was Dylan’s first performance using electric instruments. I love Butterfield’s beefy, amplified harp sound. My only qualm with this album is that there’s not enough harmonica.